You can’t go wrong putting a marinated flank steak on the grill, right? I mean, you can pretty much marinate it in anything, throw it on a hot grill and you’re going to have a great meal (and hopefully leftovers afterward). And pasta salad is a very common accompaniment to anything on the grill. It’s a barbecue staple. This pasta salad, however is the craziest version I’ve ever put together. There were things in this salad that I never could have imagined putting together in any kind of dish. I mean, squash, pineapple, and …. peas??? With mayonnaise? But you know what? It worked! 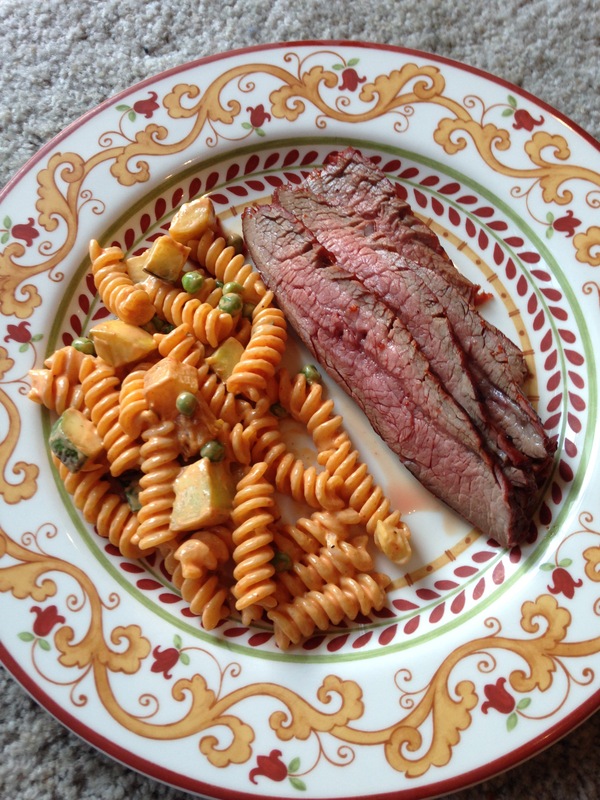 Gochujang Flank Steak and Korean Pasta Salad is not for people with timid taste buds. The steak has some nice subtle heat, but the pasta salad is very spicy. That’s where the pineapple and mayonnaise really works their magic to help cool down the fire in your mouth. But its an addictive heat and can be mitigated by using less gochujang (which I actually might do next time). The recipe comes from Food & Wine, and if you really want to shake up your next cookout and spice things up a bit, this is your recipe. The recipe calls for cooking the flank steak in a skillet on the stove. That seems sacrilegious to me. Fire up the grill and let that thing rip! Make the Steak – In a blender, puree the gochujang with the mirin, soy sauce, sesame oil, garlic, and ginger until smooth. Put the flank steak in a large resealable plastic bag and pour in the marinade. Seal the bag and refrigerate for at least 2 hours or up to 6 hours. Bring to room temperature 30 minutes before cooking. Meanwhile, make the Pasta Salad –In a large pot of salted boiling water, cook the fusilli until al dente. Drain and rinse under cold water until cool; drain well. In a large bowl, whisk the mayonnaise with the gochujang and lime juice until smooth. Fold in the fusilli. Heat a large cast-iron skillet. Lightly brush the zucchini, squash and pineapple with 1 tablespoon of the oil and cook over moderate heat, turning once, until charred and tender, about 8 minutes. Transfer to a work surface and let cool. Cut the vegetables and fruit into 1/2-inch pieces and add to the pasta. Fold in the peas and scallions and season with salt. Transfer the steak to a work surface and let rest for 5 minutes. Slice steak and serve with the pasta salad. We’ve been eating out a lot this month. House guests, restaurant openings, dinner with friends – you name it. If there was an excuse to not eat at home, we used it. However, there comes a time when enough is enough and you just need to have a sensible, homemade dinner. Generally when I get to that point, my go-to dishes are either pork chops or salmon. 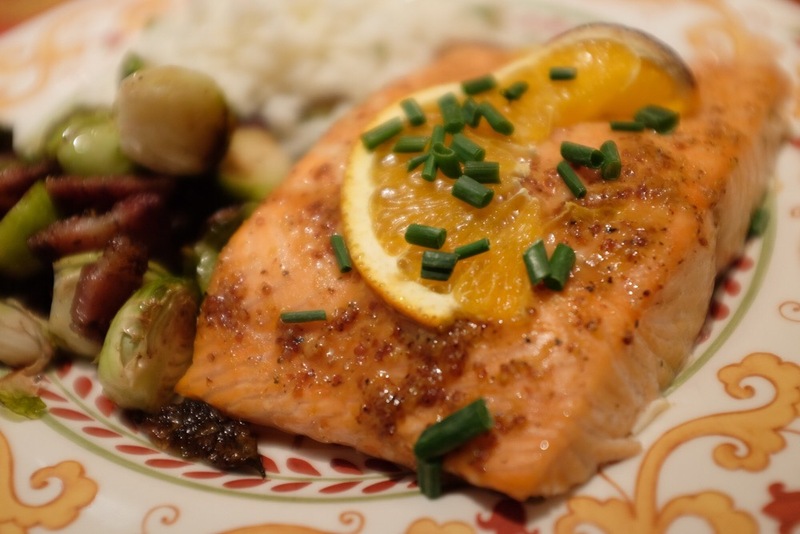 As I wanted to lighten things up a bit, I opted for the salmon and this Mustard-Glazed Planked Salmon has been one of my favorites for quite some time. The recipe comes from Coastal Living magazine. It’s easy, keeps the house cool since its grilled and allows you to char up some wood – how fun is that?? The result is truly delectable salmon with a hint of cedar smoke, a mustardy punch and the sweet zing of orange. 1. Soak wood plank in water 1 hour; drain. Preheat grill to medium-high heat (350° to 400°). 2. Remove pin bones from salmon, if necessary. Combine mustard and next 5 ingredients in a small bowl, and brush half of mustard mixture over salmon, reserving remaining mustard mixture. 3. Grill plank 3 minutes or until grill marks appear. Remove from grill. Place salmon, skin sides down, on heated side of plank. Top with orange slices. 4. Grill planked salmon, covered with grill lid, 10 to 15 minutes or until desired degree of doneness. (Check occasionally to make sure edges of plank don’t ignite.) Garnish, if desired. Serve with reserved mustard glaze. It just seemed fitting to celebrate Labor Day with throwing something on the grill. After all, it is how we welcome in summer, how we cook most of the summer, and how we say goodby to it. When in doubt, we tend to throw something on the grill. And in this household, if you’re going to bother to fire up the grill, it’s a pretty safe bet that pork will be involved. The only real question this Labor Day weekend was, what to grill? Ribs are a safe bet. Always tasty and always a hit. For just the two of us, the go-to cut is bone-in pork chops (as has been well documented in this blog.) But in both of those cases, there’s no adventure to it. We’ve been there and we’ve done that again… and again… and again. So for this Labor Day Eve when we found ourselves in need of a Sunday Supper and a suitable celebratory meal welcome in Labor Day, I thought it would be the perfect time to give this little number a try. 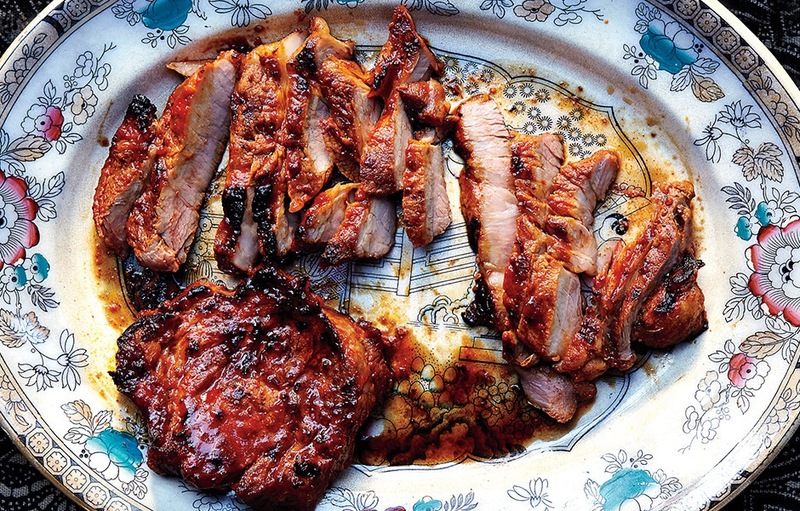 Gochujang Pork Shoulder Steaks. The recipe comes from Bon Appetit and intrigued me for a number of reasons. First of all: pork shoulder. For my money it is the best part of my beloved pig (well, maybe bacon is, but I digress). Secondly: Gochujang. I have just recently discovered this wonderful sauce. It is a Korean hot pepper paste and it is perfectly spiced. Its got heat, but will not overwhelm. It also has a gorgeous red color that turns everything it touches to a burnished red loveliness. Now for a word on the two different photos. The top one is the one from Bon Appetit. That picture also had a lot to do with me pulling the recipe. It is gorgeous. The lower one was our final result. Not as gorgeous, but dang, was it good! Puree garlic, ginger, sake, gochujang, mirin and ¼ cup oil in a blender. Set ¼ cup marinade aside; chill. Transfer remaining marinade to a large dish. Add pork; turn to coat. Chill, turning occasionally, at least 2 hours. Prepare grill for medium-high heat; oil grate. 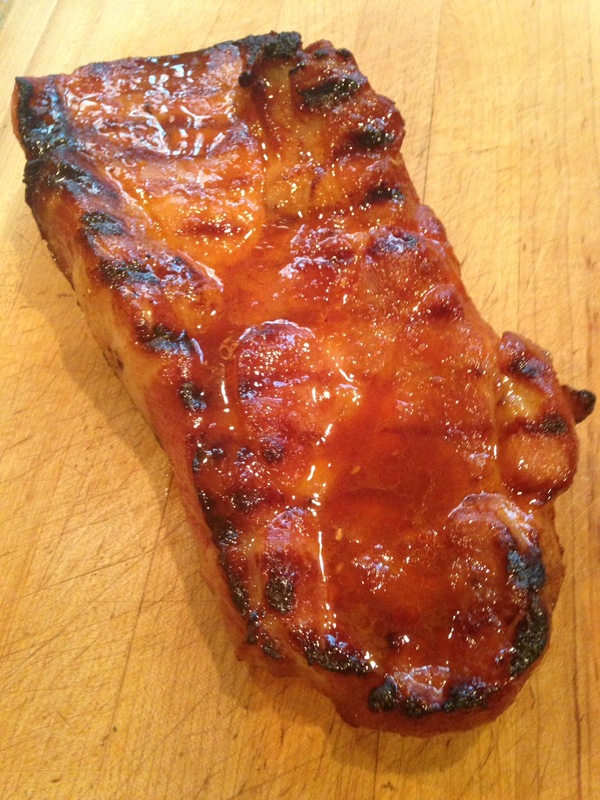 Remove pork from marinade and grill, basting with reserved marinade, turning occasionally, and moving pork to a cooler area if flare-up occurs, until cooked to desired doneness, 20 minutes for medium. Transfer pork to a cutting board and let rest 5 minutes before thinly slicing against the grain. You know how I love alliteration! 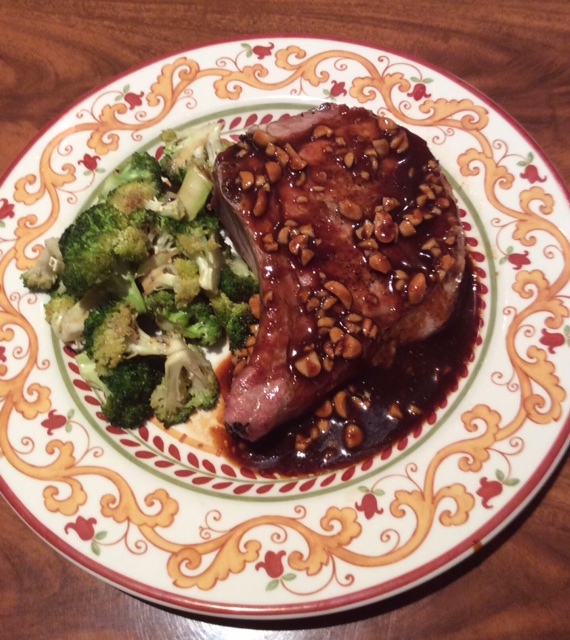 I also love a good peanut sauce as well as pork chops from my favorite butcher shop, Paulina Meat Market. Therefore, this recipe is a total trifecta of tastiness! Oops, I did it again. Sorry. Anyway, this recipe comes from Redbook Magazine (no really, I do get every magazine known to man!) and it is actually a recipe just for the Hoisin-peanut sauce but the article was on grilling and they showed the sauce with grilled pork chops. Who was I to argue? A nice benefit of this sauce is that it is applied after the meat is grilled, so you don’t have to worry about any of it burning on the grill. The other good thing about serving this on grilled pork chops (if you’re me, that is) is that your husband perfectly grills the chops so all you have to do is make the sauce! This sauce is spectacular but beware … it is hot. But its a good hot. I actually used half of the Sriracha the recipe called for and it was about as spicy as I would want it. But you do what you want … I am not the boss of you or your taste buds. Just know that I personally think it was perfect the way I made it … perfectly picante, that is! Mix everything together and brush on the pork chops a minute after taking them off the grill. This makes 1-1/2 cups, enough for 4 bone-in rib or center-cut pork chops. As a rule, I don’t like messy. I’ve always been a tidy person. Even as a child you would never find me outside making mud pies or playing in the dirt. It was definitely more in my nature to run inside panicked if there was the slightest bit of dirt on my hands. However as an adult I’ve discovered that sometimes, in order to eat really well, you have to get messy. Last night’s dinner was no exception. Sticky, drippy chicken that just begged to be picked up with your hands. All fabulous. Even the side dish was a bit “unkempt” and saucy. 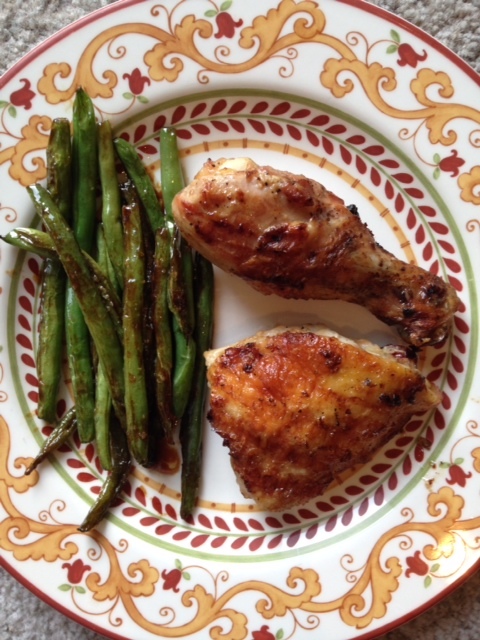 It went so amazingly well with the chicken that I’ve included both recipes — yes, for a limited time only, you lucky readers get TWO recipes for the price of one!! The chicken recipe comes from Eating Well Magazine. In the spirit of full disclosure, their original recipe called for removing the skin from the chicken. Really?? Thighs and drumsticks on the grill? Stripped of their luscious, crispy skin? I think not! Also, I realize that the dipping sauce did not make it in the picture. Do not leave this out … it is zingy and sticky and wonderful (and adds to the messiness factor!) The green bean recipe comes from Fine Cooking. I’ve made these beans a bunch of times but last night they seemed exceptionally good. I think it was the combination with the chicken. In any event, when you start off with “Fine Cooking” it will inevitably lead to “Eating Well” … if not also a bit messy. But as I’m slowly learning, sometimes messy is good. And tasty! To prepare chicken: Combine garlic cloves, pepper, cilantro stems and pinch of salt in a large mortar or food processor or food mill and mash or pulse to a coarse paste. Transfer to a large bowl; stir in fish sauce and coconut milk. Add chicken and stir to coat with the marinade. Refrigerate, loosely covered, for at least 30 minutes and up to 1 hour. To prepare sauce: Heat vinegar to a boil in a small nonreactive pan. Add sugar, stir to dissolve it, then reduce heat and simmer for 3 to 4 minutes. Add crushed red pepper and minced garlic; simmer for 1 minute more. Remove from the heat and stir in salt. Pour into a serving bowl and let cool to room temperature before serving. Remove the chicken from the marinade. (Discard marinade.) Oil the grill rack Grill, turning occasionally, until golden brown and an instant-read thermometer inserted into the thickest part without touching bone registers 165°F, 15 to 20 minutes. Serve the chicken with the dipping sauce. Combine the soy sauce, honey, and 1 Tbs. water in a small dish and set near the stove. Set a shallow serving dish near the stove, too. Reduce the heat to low, add the garlic, and cook, stirring constantly with a heatproof rubber spatula, until the garlic is softened and fragrant, 15 to 20 seconds. Carefully add the soy mixture (you’ll need to scrape the honey into the pan). Cook, stirring, until the liquid reduces to a glazey consistency that coats the beans, 30 to 45 seconds. Immediately transfer the beans to the serving dish, scraping the pan with the spatula to get all of the garlicky sauce. Let sit for a few minutes and then serve warm. I love it when a plan comes together. Every once in a while it seems like all the stars align to create a perfect dinner combination. And when almost all of said dinner is prepared on the grill — even better! A delicious dinner with practically no clean up, that’s what I’m talking about! These potatoes I have made for years and they never disappoint. The chicken however was a new recipe. I definitely was not familiar with gochujang and when I first tasted it out of the bottle I was a bit concerned. This is seriously spicy stuff! However, once combined with the buttermilk, it really wasn’t that hot. Just nice and zippy but definitely not blow-your-head-off. But it was the combination of the sweet potatoes and the chicken that was spectacular. Keep your kitchen cool and prepare this delicious — make that “grillicious” — dinner. The chicken recipe comes from Southern Living Magazine and the potatoes come from Martha Stewart’s Everyday Food. Stir together first 4 ingredients in a large shallow dish or zip-top plastic freezer bag. Add chicken, turning to coat. Cover or seal, and chill 1 to 3 hours. Coat cold cooking grate of grill with cooking spray. Preheat grill to 350-400 degrees (medium-high) heat. Remove chicken from marinade, discarding marinade. 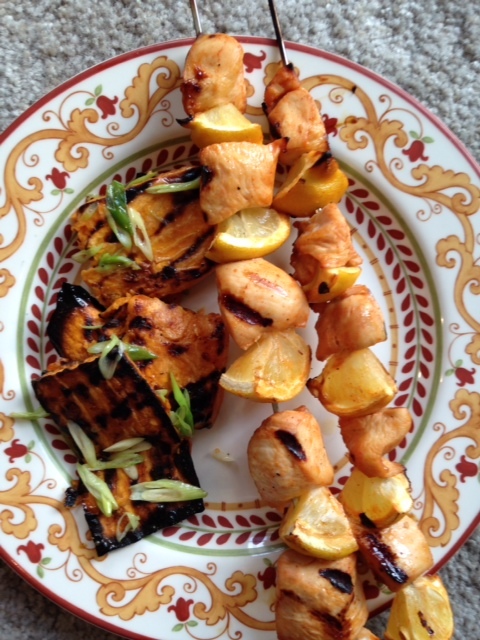 Thread chicken and lemon wedges alternately onto skewers, leaving 1/8 inch space between pieces. Grill kabobs, covered with grill lid, 6 to 8 minutes on each side or until chicken is done. Heat grill to medium. Peel 3 sweet potatoes and cut lengthwise into 1/2 inch thick slices. Toss potatoes in a large bowl with 3 tablespoons olive oil, 1 teaspoon dried thyme and 1/4 teaspoon cayenne pepper; season with salt and black pepper. Grill potatoes, turning frequently, until tender when pierced with the tip of a paring knife, 20-30 minutes. Return grilled potatoes to bowl; add 2 tablespoons butter, and break potatoes into large pieces with the side of a spoon. Toss in 2 thinly sliced scallions, and serve. I dearly love skirt steak. It is one of my all-time favorite cuts of steak. 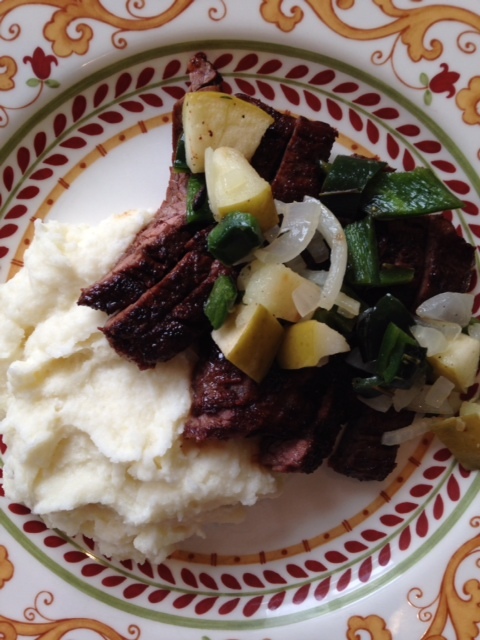 I make a lot of skirt steak, not only for me and my husband, but also for my clients. All around it’s a fan favorite. I’ve made skirt steak numerous different ways — grilled, sautéed, broiled, and stir-fried. It’s always good and the meat is always flavorful. That’s what I like most about the cut. It tastes like meat. No matter how you season it, whether it has a marinade or a finishing sauce, the end product is juicy, steaky, meaty goodness. Having said all that and sang all those praises to the glorious skirt steak, let it be said that I have never made a better skirt steak than I did this past Sunday. This recipe surpassed all others. Truth be told, it was the relish that initially caught my eye. I thought it sounded interesting and would make a nice addition to skirt steak which I knew would be fabulous. The relish was delicious. It was really good. But honestly, it was all about the steak – with or without the relish. The recipe is Coffee and Ancho Chile Skirt Steak with Green Chile-Apple Relish and comes from Sunset Magazine. I will definitely be making this again and I am anxious to try the rub on other cuts of steak as well. There is something about the coffee, ancho and brown sugar mixture that totally amps up the beefiness without overpowering it. It still tastes like steak … only better! 1. Heat a grill to medium-high (350° to 450°). In a small bowl, combine coffee, chile powder, 2 tsp. salt, and the brown sugar. Rub all over steak and let sit. Rub green chiles, apple, and onion with oil and season to taste with salt and pepper. 2. Grill steak, turning once (dry rub on meat will be very dark), 8 to 10 minutes total for medium-rare. Meanwhile, grill chiles, apple, and onion until lightly charred all over, 6 to 8 minutes. 3. Transfer everything to a cutting board, tent steak with foil, and let rest 5 minutes. Meanwhile, chop chiles, apple, and onion and transfer to a medium bowl. Stir in oregano and lime juice and season to taste with salt and pepper. 4. Thinly slice steak against the grain and top with chile-apple relish.